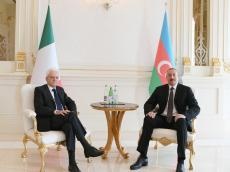 Azerbaijani President Ilham Aliyev and Italian President Sergio Mattarella had one-on-one meeting July 18 after the official welcoming ceremony. The successful development of bilateral relations between Azerbaijan and Italy in political, economic and other areas was noted during the meeting. The sides voiced confidence that the official visit of President Mattarella to Azerbaijan will contribute to expansion of bilateral relations. The two presidents held an exchange of views on bilateral relations and other issues of mutual interest.